These cases are for an iPhone 5c ONLY. They will not fit any other phone type. GemShell case fits iPhone 5c. See-through style. 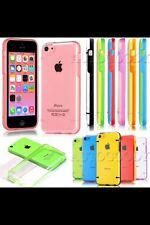 Crystal-clear iPhone 5c case shows off your iPhone’s sleek, colorful body. Save face. Raised edges help protect your screen from impact and add grip so your iPhone can lie face down on tables or dashboards without sliding. CandyShell Faceplate is Speck&'s dual-layer, protective iPhone 5c case with a screen protector that’s designed to make an impact-and take one. Our protective iPhone 5c Faceplate makes your phone's screen 2x stronger against direct impacts with five layers of lab-tested technology. Device: iPhone 5c. NAKED TOUGH CASE - CLEAR. Transparent smooth finish with anti-scratch technology. Enhanced impact resistance and shock dispersion. Fosmon HYBO-FENDER series provide all round protection for your iPhone 5c. The Fosmon HYBO-FENDER cases are designed with style to protect your iPhone 5c from active lifestyle. Fosmon HYBO cases are combination of thermoplastic polyurethane (TPU) and polycarbonate (PC). It is abrasion resistance, and has a high degree of transparency. Apple does not endorse use of these products. Apple® does not endorse use of these products. Apple iPhone 5C | 5 C device not included.